Little Mommy Baby So New #Giveaway CLOSED!! My daughter is a little girl who loves playing with dolls. She loves all of her dolls and her baby dolls are ones that she and her friends love to play with. My daughter is half Hispanic and she has that beautiful golden glow to her, so when I get dolls for her I do like to find dolls that have her skin tones. One brand of baby dolls that I have loved getting Estrella since she was a baby is Little Mommy. She got her first Little Mommy doll when she was a little over a year old. I loved how soft the body was and she loved cuddling with her baby doll at the time. As she has gotten older, she has continued to love the line of baby dolls from Little Mommy. I love that the Little Mommy line of dolls makes their dolls for girls of different colors. 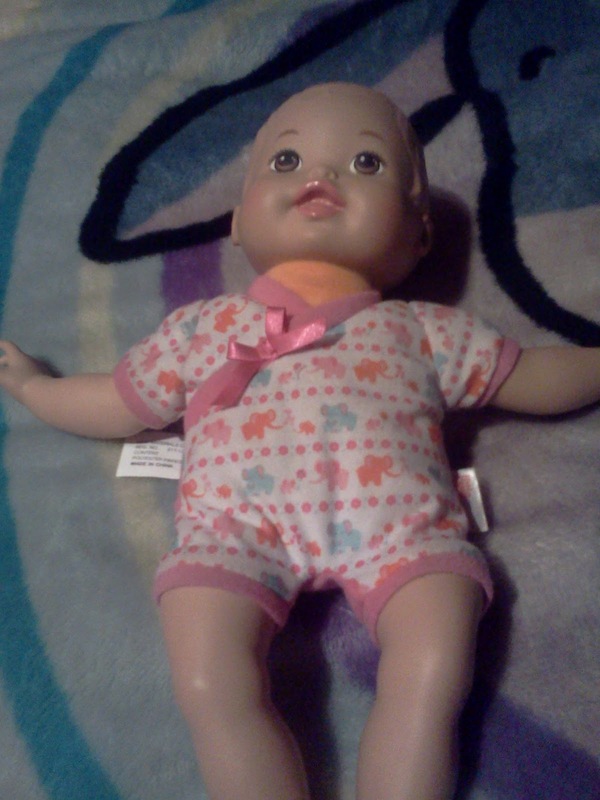 Recently we were sent the Little Mommy Baby So New Hispanic doll to review. This doll came in, just in time for Estrella’s birthday. When she came home to all of her birthday gifts, the Little Mommy Baby So New Hispanic doll was one of the first items that she had to open and start playing with. Since we are preparing for a new baby in our house, she felt that it was her obligation to show her little brother how to hold a new baby right and how to take care of a new baby to the best of her knowledge. Even though her brother is a boy and isnt too fond of girl toys, they have both enjoyed playing with this baby doll, pretending that it is their new little baby sibling. This adorable little doll comes wearing a very adorable romper and cap, it also comes with a bottle and blanket. I love that my daughter is showing her brother how to hold a bottle and how to swaddle a baby as well, though I will be monitoring how they handle the new baby, I am glad that they are both eager to be the best older sister and brother they can be!! Well the wonderful people from the Little Mommy line of dolls would like to send one of my amazing readers their own Little Mommy Baby So New doll!!! Head on over to the Little Mommy site and hit the like button at the top left hand side, leave me your Facebook name with this entry! Please leave me your email with this entry! This giveaway is open to US residents. This giveaway will end at 11:59 pm on April 15,2012. Winner will be chosen at random.org and will be given 48 hours before another winner will be chosen. All products for reviews and giveaways are given as a sample from the companies. All opinions in reviews I conduct are my own. I was not paid to say anything or review any products. I entered your Zutano gift card giveaway. I entered your Veggietales DVD giveaway. I entered your Lorax/Seventh generation giveaway. I liked Little Mommy on facebook.